One morning at home, a haunted and cinematic mood settled over me. I searched iTunes for the genre, "film noir". 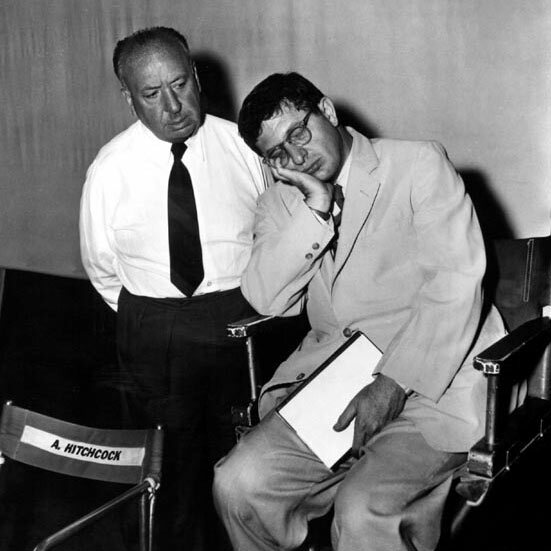 Several soundtracks and soundtrack compilations are featured, including many with, and even dedicated to, Bernard Herrmann, who composed the music for Hitchcock's masterpiece, Psycho. I chose "Bernard Herrmann Film Scores: From Citizen Kane to Taxi Driver" by The City of Prague Philharmonic Orchestra. Setting my iPhone to play through my bluetooth speaker, I brought it into the bathroom and started getting ready for work. "Citizen Kane - Suite," is the first track. I felt satisfactorily haunted as well as if a mystery was about to be solved. It seemed like a promising selection. I remembered something in the other room then returned to hear, "The Devil and Daniel Webster - The Devil's Concerto." I was unfamiliar with it but recognized the deep South style. There are fiddles... or violins sounding like fiddles. It is very "Devil Went Down to Georgia" ... the devil's part. This evocation of intrigue and suspense was still working though. Next up was, "The Man Who Knew Too Much," which conjures an atmosphere of crime solving, zooming in on a detective's door while a disembodied hand reaches for the knob, or a silhouette walking with a cigarette on a foggy dock, a lonely streetlight illuminating just the mist around it. But wait, do I sense a shadow? I turned on the shower, and while I waited for it to warm, I escaped my pajamas and took the clips and ties out of my mess of hair. It had been days since I'd washed it. After a few minutes, I stepped in and ahhh, the wet heat of a blessed shower. It is great, no? Parts of me were washed, then I checked the clock. Yes! I can just make it if I don't fuss too much. I can wash my hair, comb conditioner through, towel off, haul out the blowdryer, and embark on that tedious yet somehow meditative procedure of combing, brushing and drying my mane and then yes there's more, curling the ends with an iron for that bounce I love so much. It makes me feel like a million, I tell ya. These commonplace concerns or something similar were meandering through my mind while massaging shampoo into my soaked scalp when it happened. The next track began, and it was intense! Like music for a scene in which you're chasing a wounded animal through a damp, early morning forest where a recent disappearance is menacing a nearby village. For two minutes, that's the mood. Oh, what adventure are we embarking on!? Then the song goes rather silent. For the next minute and a half, a very low and slow building of strings introduces the potential of danger, so you may even forget that you're listening to music especially with the water and the washing and it being an ordinary morning in your own real life. I panicked. It was so terrifying! I have glass doors in my shower, so from the safety of the stall, I looked around to confirm that I was still alone in my bathroom. There appeared to be no one lurking nearby. I considered getting out to forward to the next song or at least turn it down, but I was too afraid to step outside my own shower, so I cowered, anxiously waiting for it to end. If I'd been in a shower with a curtain, oh hell no. I would not have been as cool as Rihanna when it happened to her. I would've been out of there so fast I probably would have hurt myself. It was the scariest 50 seconds of my life. Y'know what you never want to hear—loudly and unexpectedly, or really, ever—while you're in a shower? The version above has a longer intro and a redux, but it'll still get ya. It's fascinating (and kind of scary!) to watch an orchestra play it, to see how they create that heart-stopping, discordant screech, and in unison. It's a wow.